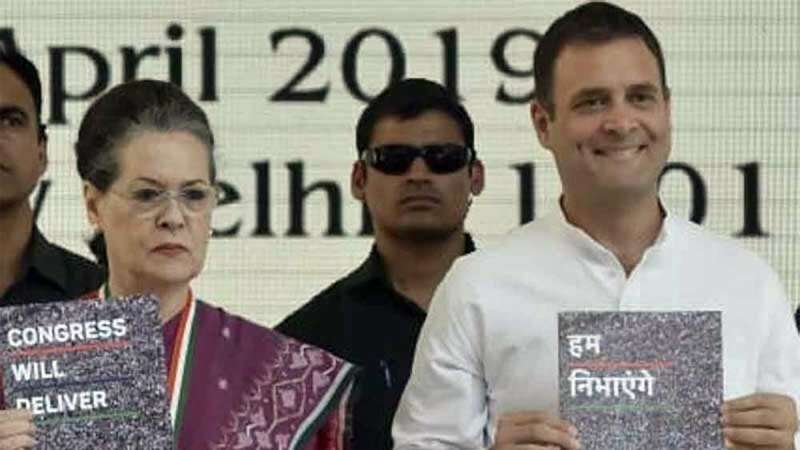 New Delhi : The Indian National Congress on Tuesday released its poll manifesto for Lok Sabha Elections 2019, set to start from April 11. The announcement was made in the presence of Congress President Rahul Gandhi, Sonia Gandhi, former PM Manmohan Singh, Priyanka Gandhi and other prominent leaders from the party. # Will bring Right to Homestead Act that will provide a piece of land for every rural house that does not own a house. Only homes can be made on the allocated land. # Will bring fuel prices under GST within two years of coming into the power. # Will provide a minimum 150 days of employment under NREGA against the current 100 days provision. # Will implement NYAY scheme to give economy a boost. # Will double expenditure on healthcare to 3% of GDP by 2023-24. # 6% of the budget will be allocated on education sector. # There will be a separate budget for farmers like we have for the Railways. # Startups will not require any permission for first three years. # Will fill the 22 lakh vacancies by March 2020. Bharatiya Janata Party is yet to announce its poll manifesto.